Many watercolor artists avoid painting clear glass in watercolor because they are unsure how to approach the subject. This is a painting I did as a demonstration for a class. I chose a simple subject with three objects and a dark background. The salt shaker was clear, patterned glass and contained some salt. I purposefully tilted the salt to make the composition more interesting. To paint clear glass you, like other glass, you need to look for the reflections and refractions that occur in the glass. 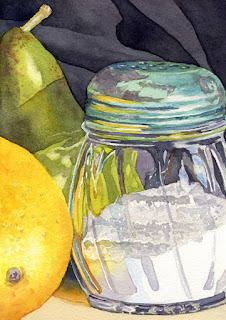 The reflections in the salt shaker are things like the bright yellow on the lower left of the glass that occur due to the lemon. Refractions happen when something next to the glass or on the interior are bent, curved, or the color is changed due to the glass. In this painting the green of the pear can be seen through the glass, but it is distorted and the color is slightly brighter than the actual pear. Painting glass is like working a puzzle, you paint or leave white, the small, usually abstract shapes that make up the whole. The metal lid of the salt shaker is another place to look for unusual reflected colors or highlights. For the colors in a clear glass jar, don't just use grays, but look for other colors that might be reflected from surrounding objects or lighting. 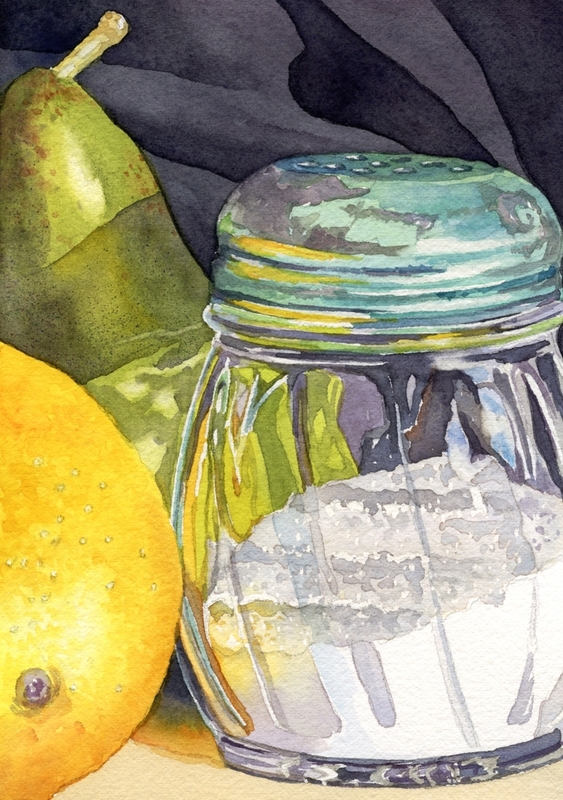 In the salt shaker I added yellow, green and blue to areas of the glass. Some of my grays are purple tinted or blue tinted to give them some variation. The whites of the shaker and salt are the white of the paper. The smaller lines were masked out to save them, then the masked removed and the white cleaned up by matching the paint around the white area . Some of the whites were scrubbed to soften them to give them the look of a reflection. Thanks for explaining the process...gives one a greater appreciation of this lovely painting. Your explanations give a greater appreciation for the nuances that go into creating a painting. Thanks for sharing. Great analogy about paint glass being like a puzzle! Awww great post sharing those ideas! I've been to art lately and I'm trying to find some easy glass painting designs that I can try as beginner. Thanks for sharing ideas.